Believe it or not, I have occasionally been accused of being an expert at finding the hardest way to do things. I come by this talent naturally, my late father being the true expert in this field. However, when it comes to building a wooden boat to a deadline, sometimes the simplest solution is the best. 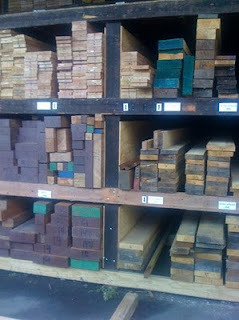 For the last month or so, I've been asking all my new boat builder/wood worker friends where to buy boat lumber. There are many answers to this question: from a company in Brooklyn that sells wood recovered from 200 year-old buildings (built from old-growth timbers that are no longer available), to a company in New Jersey that supposedly sells wood sawn from White Cedars that fell into Jurassic-era swamps, to small lumber mills hidden away in the dark hollows of New England. However, there is one company that appears -- with positive or negative comments attached -- on nearly everyone's list: M.L. Condon, of White Plains, NY. The positive comments tend towards the "they have everything" line. The negatives focus on their supposed high prices and Bimmer driving, Brie eating, yuppie clientele. Some of my best friends used to be yuppies (before the Crash) and I don't mind a bit of Brie, but the rumors of high prices were a bit of a turnoff, so I almost skipped Condon's even though they were next on my list. I'm sure glad I didn't. If I haven't made it obvious, yet, I am a bit intimidated by this whole boat lumber buying thing. I've learned a few things from books -- enough to convince Helena, anyway -- but my confident facade crumbles under the fire of one or two questions from a real lumber guy... I'm clearly clueless, and feel that way. Thus, I pulled up to the smallish-from-the-outside Condon yard with a less than happy feeling in the pit of my stomach. As soon as I walked into the office, one of the managers greeted me. With a few questions, he gently extracted both my needs and experience level. But instead of using this ammo to shatter my confidence, he simply assigned a yard guy, named Matt, to help me. Actually, Matt was more than a helper. He was like my personal wood concierge. As Matt escorted me down to the lumber yard, I discovered that one rumor about Condon's is true: they do have everything, or at least everything I could imagine at the moment. 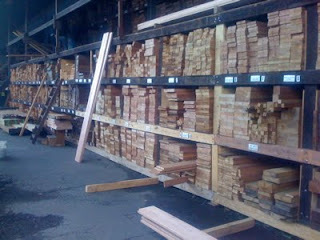 One tier of lumber at Condon's. There's another on the mezzanine, above. Not only do they have everything, it's neatly organized. For some reason, I found the tidy labels reassuring. Even I could understand what I was looking at. Matt helped me find everything I needed. He pulled out planks so I could inspect them, patiently helping me find the one that 'spoke' to me. I made him pull out a lot of planks, and never did he show the slightest frustration. Amazing for this day and age, he seemed to be there to help me. Mind you, Matt and his boss knew I was only looking for two things: a long oak plank for the keelson, and a piece of mahogany big enough for Cabin Boy's small transom. They knew I was a small fry. It didn't seem to matter... go figure. Once we found the two pieces of wood I needed, Matt offered to plane them down to the thickness I needed for a few bucks more. I hadn't even thought of this service, but two or three passes through this machine saved me a couple hours of hand-planing. Clearly, someone in Condon's management knows what he or she is doing. Not only do they have the wood that boat builders need, they provide the service that makes it accessible, even to clueless newbies like me. If the problem of buying wood has been a problem for you, as it has been for me, their service might get you over the hump. Finally, a word about prices. All I can say is that they are competitive or better than prices I've seen at other yards in the New York metro area. Admittedly, my wood buying experience is limited. 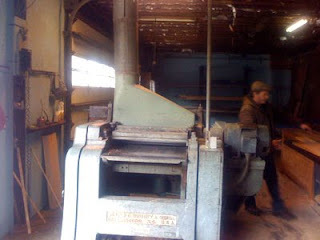 Probably it is possible to buy wood for less at a small mill up in the woods if -- and this is a big if -- you know exactly what you're looking for and can negotiate a better price. But for a newbie like me, the hand-holding at Condon's was just what I needed to get me over the lumber-buying hump, so I could keep my project moving forward. I add my recommendation to the chorus of happy customers out there. And maybe next time they'll serve me the Brie! Jessica Watson is hoping to become the youngest person (not woman) to sail non-stop around the world. Her boat may be pink, but she's headed for Cape Horn. Buying lumber that's dried and ready to go is great, but it's cheaper to buy green lumber and dry it yourself. If you're the kind of builder who thinks ahead, this video will help get you started. It was nice to hear about Condon's. Buying material has been one of the things that has kept me from getting going. I am in the Peekskill area and knowing there is a source that I can actually go to and see the stuff will be a "starter" for me. Thanks.